Scarce postcard capturing 16 members of the 1907 American League Champion Detroit Tigers in a classic team pose, including Ty Cobb, Sam Crawford, manager Hughie Jennings, Davey Jones, Ed Killian, George Mullin, and Germany Schaefer. What makes this particular postcard so striking is the unique background design that features the superimposed image of a Tiger. 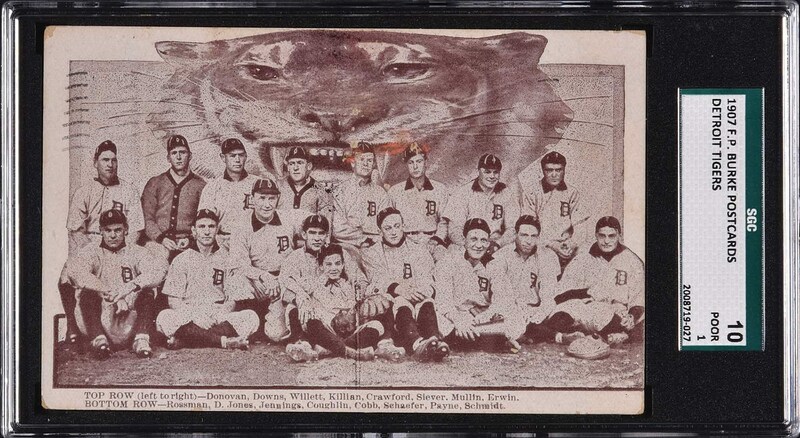 This is just the second example of this particular Detroit team postcard we have offered and we have seen fewer than six other examples. All of the players are identified in print along the white base. The name of the manufacturer, “F. P. Burke,” is printed on the reverse. 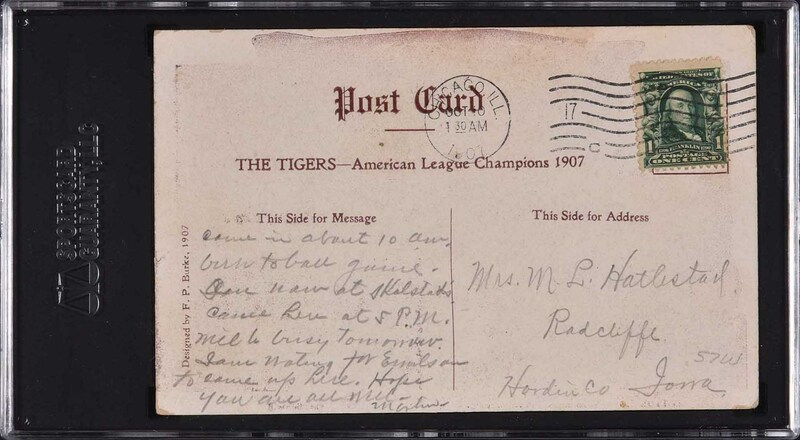 The card has been addressed and mailed, with the postmark bearing the date “Oct 11 1907, Chicago, ILL," which was the day Game 3 of the World Series was played at Chicago. (One can only assume that these postcards were sold at both venues during the Series.) The card (5.5 x 3.5 inches) displays two tack holes in the center (touching upon the images of Crawford and Siever), a small red blemish on the front in the area of the tack holes, and moderate corner wear. Graded POOR 10 by SGC. This is a desirable Detroit Tigers souvenir dating from Cobb’s second full season and the first of three consecutive American League Championships for the club. Reserve $300. Estimate $500+.